Craving a popular updo that’s easy to create at home and is perfect for dressing up or down? 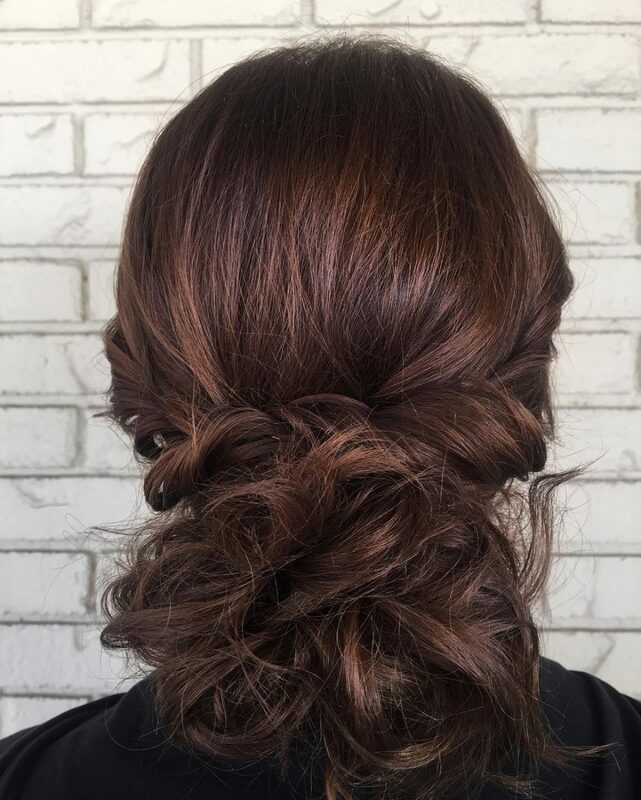 Messy updos are where it’s at! 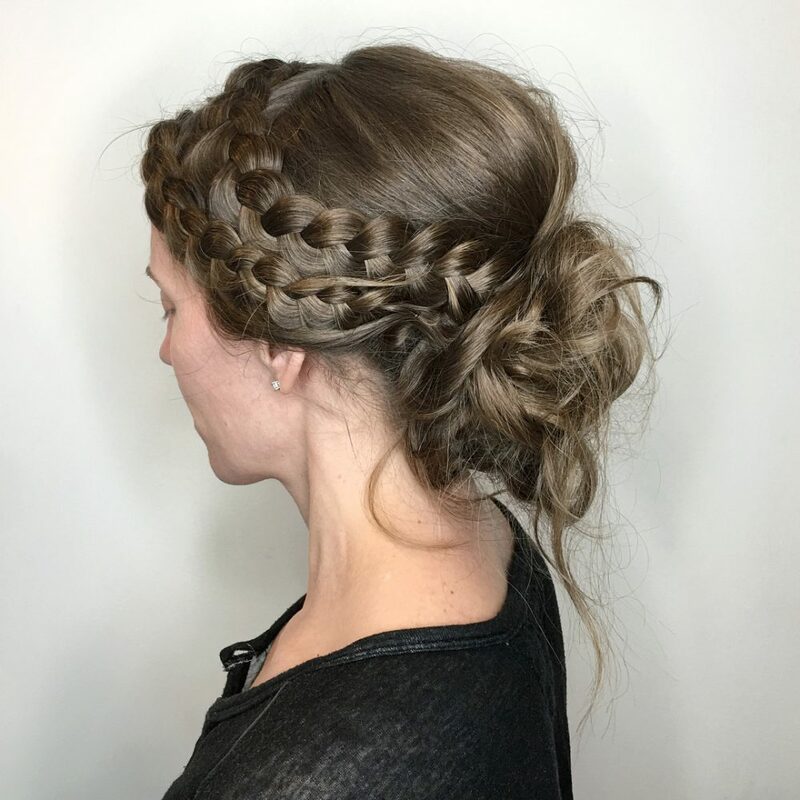 Curls, braids and pins can be used to create simple yet beautiful tousled updos. These looks below are the perfect inspiration you need to put your hair up, no matter what the season or occasion. Just remember that simple is better when it comes to messy looks. Don’t overthink your steps! 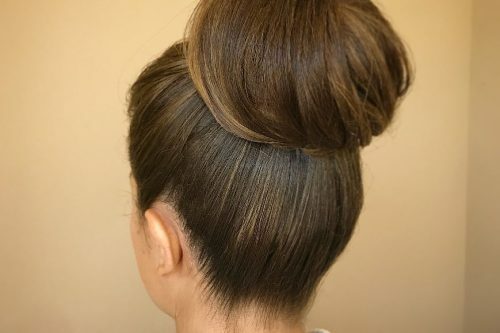 Textured hair is the easiest hair type to use for stunning messy buns like this one. Simply scrunch up those curly pieces and hold in place with pins, and it’s done! 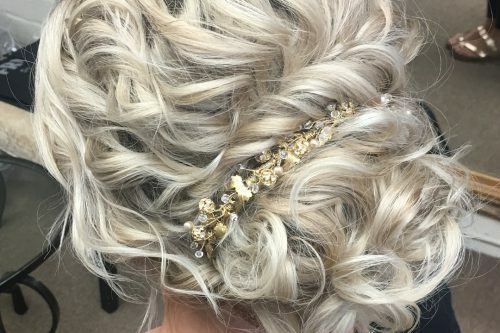 Wedding hairstyles are starting to trend with messy looks like this one. They’re perfect for brides and bridesmaids! I would describe this look as a very whimsical enchanting tousled updo. You have the romantic vibes with the soft twist but also a little bit of texture with the pieces falling out. 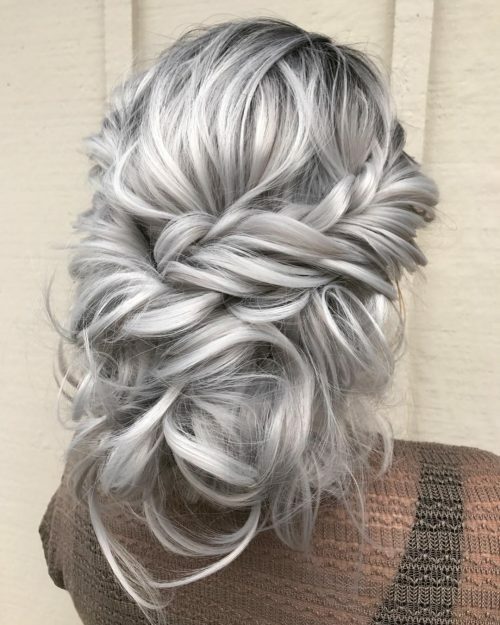 My favorite thing about this updo would for sure be the color of the hair. Without that gorgeous silver, it wouldn’t have the same effect! Make sure you have plenty of hair. If not, pop some extensions in there! This look is very full and voluminous. Make sure you have plenty of texture products nearby to spritz when you need that airy textured look. Personality wise, I think those who like that boho feel and are free spirited it would be a perfect fit! I would describe this look as a textured, messy updo. I love that it looks so effortless but well structured. This look is perfect for a bride or bridesmaids. But you could definitely use it for any special occasion. This style works best with medium-long hair with a medium texture. I would best describe this look as being a texturized messy look. My favorite thing about it is that it is so versatile! You could wear this look to school, work, an evening out with friends or even as a cool bridal look! I have had so many brides this year asking for this specific style. If you are considering a look like this I would recommend doing it on 2 day washed hair. That way you already have some great natural texture and it also really helps keep it all together! – I went ahead and roughly curled sections with a 38mm barrel tong, and used Tigi Professionals 2 day dry shampoo to add a bit more grit and to roughen it up. – Section the hair in 2 and create a messy kind of bun. This will be your ‘base’ for the style and keep it feeling really secure. – You then want to form a loose twist in the curls and randomly pin them on the bun. It really doesn’t matter, just have fun and be creative with the style! – Then go ahead and spray with hairspray. This will really work on any hair type and is a nice relaxed style. There are no rules when it comes to texturized styles! For a Bridal or Prom look it is perfect to form a romantic up-do which would flatter any gown. 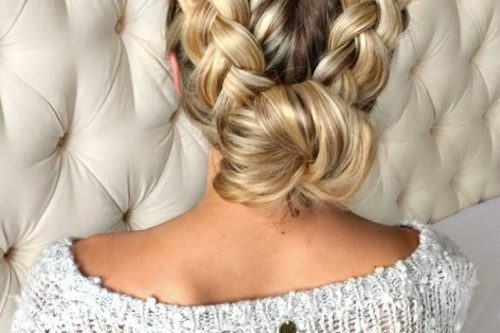 This hairstyle can literally be worn anywhere with anything! In fact, I love just wearing it whilst I am working. It is current in hairstyling, fun but amazing too! This look is for the lady who has class but with a little edge. This is a polished yet unrefined, perfectly imperfect style. 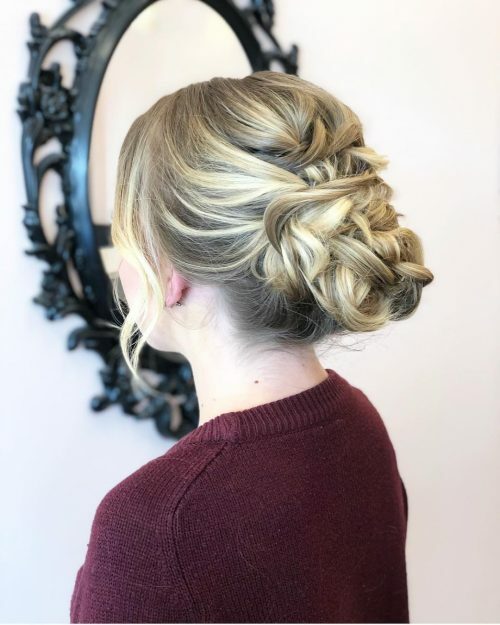 I love that this updo is so versatile and can be worn every day or for a special occasion. You can add some accessories for a bold statement or florals for a softer, more natural element. Additionally, this style sets a great tone for your complete look and pairs well with whatever mood is striking your fancy. Work with your texture and don’t fight your curl/wave patterns. Instead, enhance them with product and use hot tools to help refine random pieces if needed. Don’t have any texture? No problem. The key to creating wanted texture is building with product and shaping with hot tools. Sea salt sprays, textured powders, dry waxes, and a teasing comb are my go-to tools for creating this look. Braids and twists also add another fun and flirty element and help make sure your style stays put. Above all else, HAVE FUN. This doesn’t have to be perfect that’s the beauty of it! I would describe this look as a textured romantic updo. I love this style because it is structured but undone at the same time. It is soft around the face and has smooth interlocking transitions on the sides and into the back. I recommend this style for clients with medium to thick hair. If the client has thin hair, I would suggest clip-in extensions. I also use Kenra Dry Texture spray which is an excellent product that applies a grit to the hair without weighing it down or making it feel dirty. This style works best with face-framing layers and swoop bang. This is a textured, whimsical style that could also be translated as edgy and fun, depending on your outfit of choice! My favorite part of this creation has to be the effortless flow and texture it gives. It has such a natural silhouette which is great for the “undone but done” look that still looks pretty. This updo is versatile and can accompany multiple looks, personalities, and face shapes. You could add more volume up top to make the face appear slimmer, or decrease it to add width. Texture spray, or really any wax-based product, is a must. My personal go-to is Kenra’s Dry Texture spray or their Air Grip Spray to really give that definition and separation, as well as grip. Finer hair will definitely need a little extra product to rough” the hair up a little bit and add some volume. Puff Me by Design.Me is a great volumizing mist to add that. Anywhere is acceptable to flaunt this style! It’s perfect for formal occasions such as weddings, dances and holiday parties, but is still just as great for a night on the town. You could also totally rock this during the day by loosening it ever so slightly, adding simple makeup, and wearing a cute casual dress. 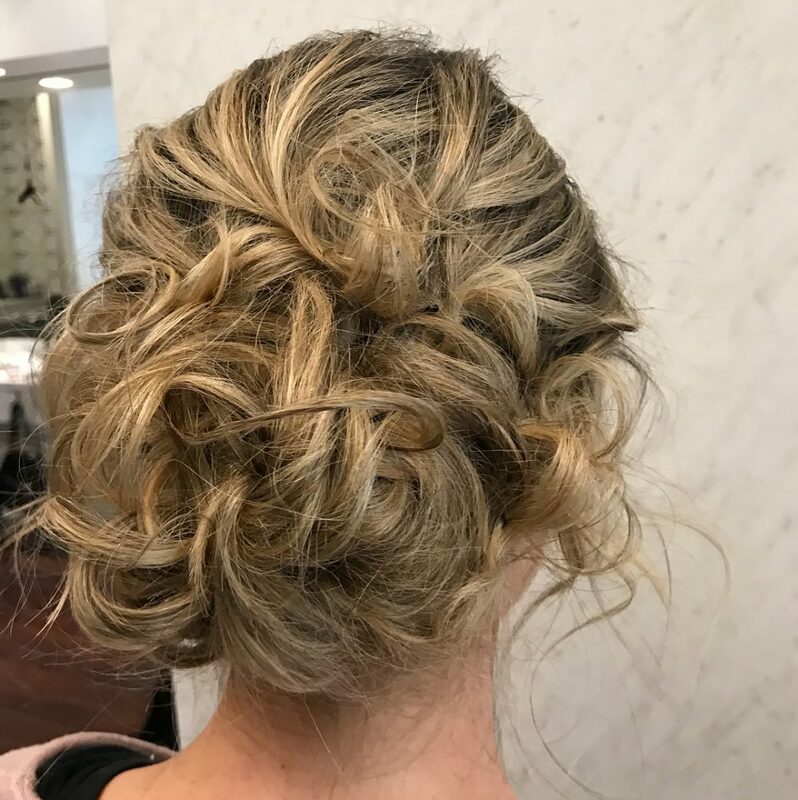 This is a fun and sassy textured updo that I brought to life. 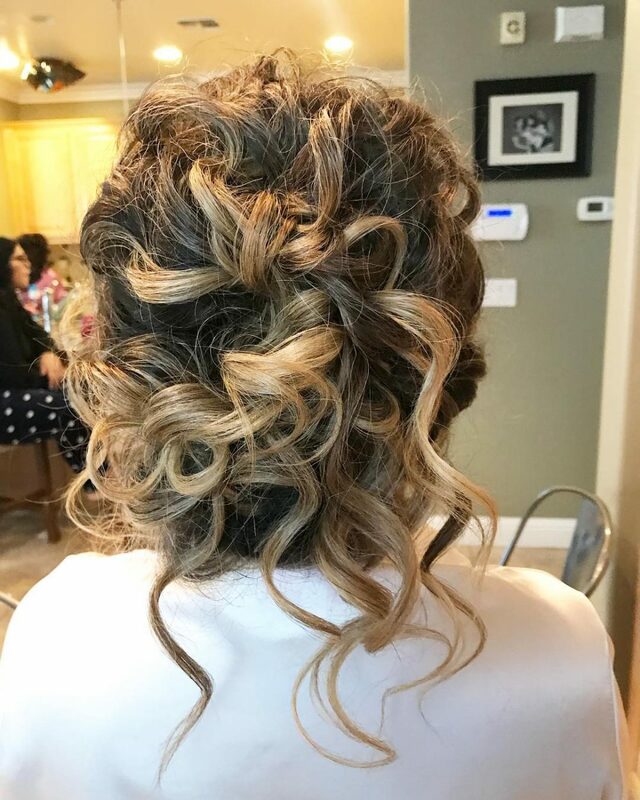 The client mentioned to me that she really wanted to feel beautiful and catch her husband’s eye, so in my head, I was absolutely obligated to give her a “stand out” look. 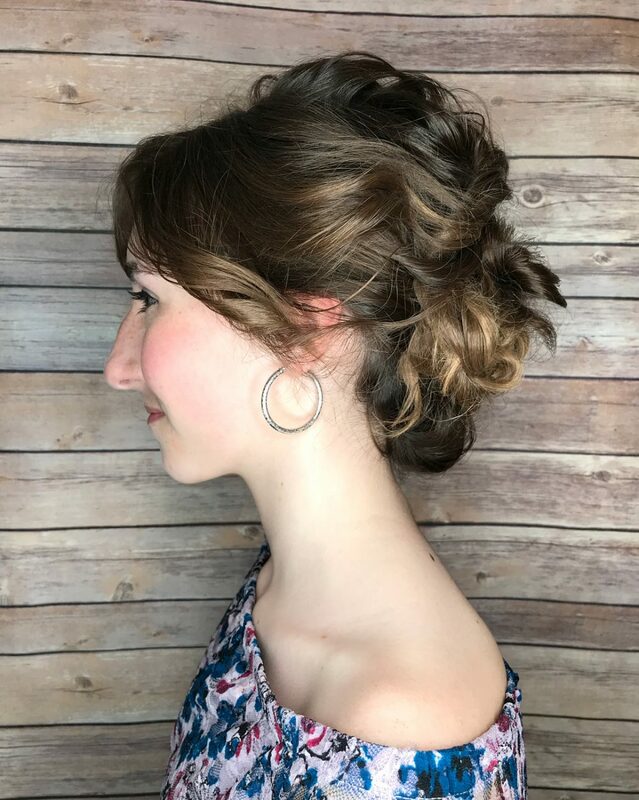 My favorite part of this updo is both sides. I loved the way they flowed directly back. The sides really created an elegant feel and made it perfect for the occasion. Honestly, this exact same style would not show as much dimension someone who has all over dark hair. She was a blonde with a red undercolor. In my opinion, color is everything when you are creating a textured updo! It is imperative that the length come below the shoulders because in the initial preparation, I produced fairly tight curls. Her length ended in the middle of her back and it gave me a lot of hair to work with. Hairspray is key in keeping this look in place all day or night! I would describe this look as a bohemian twist on a basic updo. My favorite thing about it is, of course, the double Dutch braids! This client had a lot of hair, so a double braid worked really well for her. 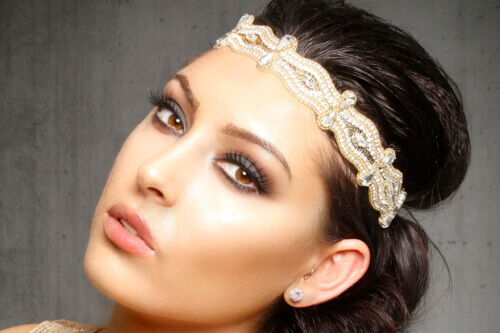 This is a great look for a bride or bridesmaid, a holiday party, or even a fun night out. If you’re considering this look, make sure you have enough hair to do a double braid! It won’t work with hair above the shoulders. This style requires about an hour in the salon and lots of hairspray. Make sure to carry a few extra bobby pins to your event in case anything should fall loose. My favorite thing about this look is how easy and quick it is to do! I love how messy and fun it is, yet classy and professional as well. I’m die hard Aveda fan! To achieve this look I used the Shampure dry shampoo to give the hair a little more texture and the Air Control hairspray for hold. A tip to help achieve this look is that it doesn’t have to be perfect! That’s what I love about it. I made two buns on top of each other, bobby pinned them together, then just fluffed the buns and pinned as needed! This look should be for someone whose hair type is normal to thick in density. The hair can also be shoulder length or longer! This look would be suitable for a business woman or someone who is going to an event. I would describe the look as understated and deconstructed. I think that sometimes updos can look little too polished. This isn’t always needed nor does it reflect current trends. I used a heat protection spray by GHD and a mousse by Sassoon, but the equivalent in any salon/professional range would suffice. This look would be perfect for any woman who’s going to a holiday party. I think it also lends itself to the modern day bride who likes to have a modern edge. I describe this type of hairstyle as effortless but elegant. I love how fast it is to do this hairstyle and how it works for any occasion. A great tip for creating this look is to curl your hair first then pin up your hair as you go. Quick and simple! This hairstyle is great for special occasions. It’s great for people who have fine or thin hair because this hairstyle will make the hair look much fuller. I would describe this look as a messy yet classy and chic updo. My favorite thing about it is that it can be dressed down or up. Worn as shown, it can work with a simple t-shirt and ripped jeans with the right lip color and heels. It also easily goes with a long dress and a fancy hair clip to dress it up! I definitely recommend using dry shampoo and a anti-humidity spray. It gives the effect of a stronger spray holding-wise, but let’s you piece and work gently and softly. 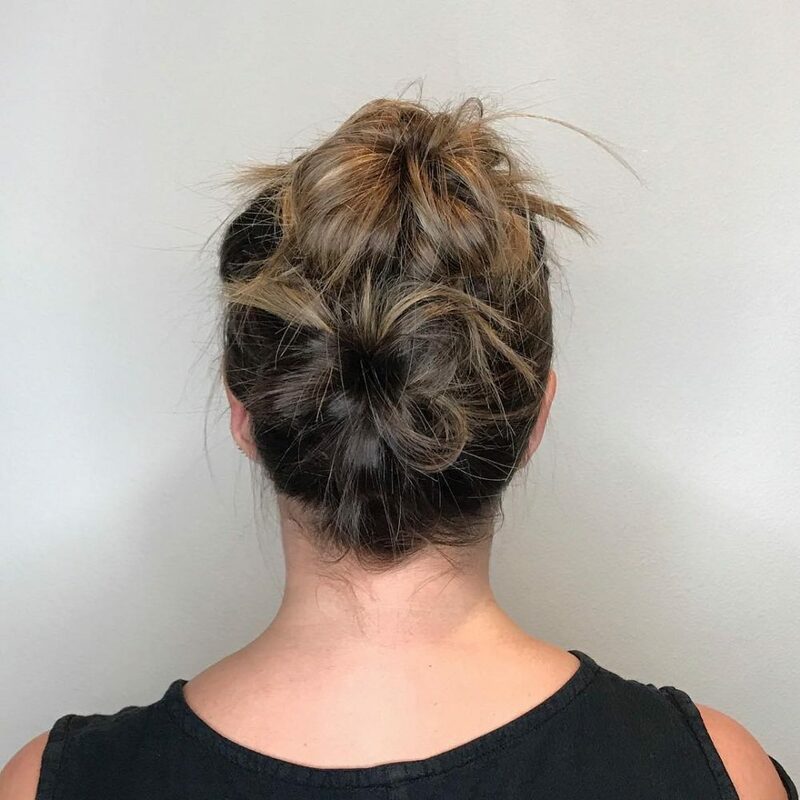 There is no wrong or right way to do a messy bun. I just play around placing different pieces, and if it works, it stays. 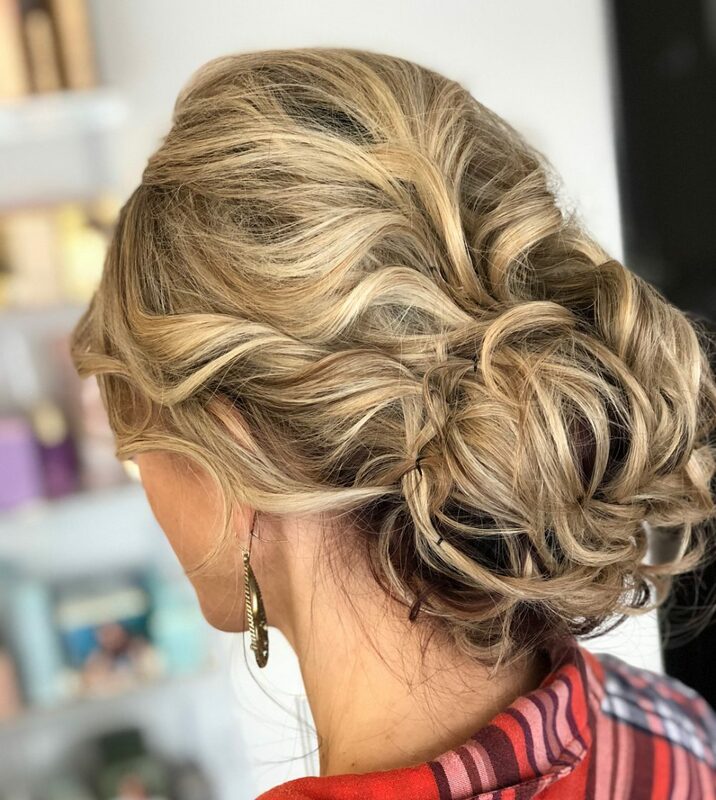 The best thing about this updo is that it can pretty much work for any client. It is a very versatile look and has been done on clients who are attending functions at extravagant banquet halls, or someone celebrating their 21st birthday. It is ideal for someone on the go. Someone who has no time for anything fancy can easily recreate this and make it their own. Pulling some pieces out, or pulling everything away from the face, it complements anyone’s shape! 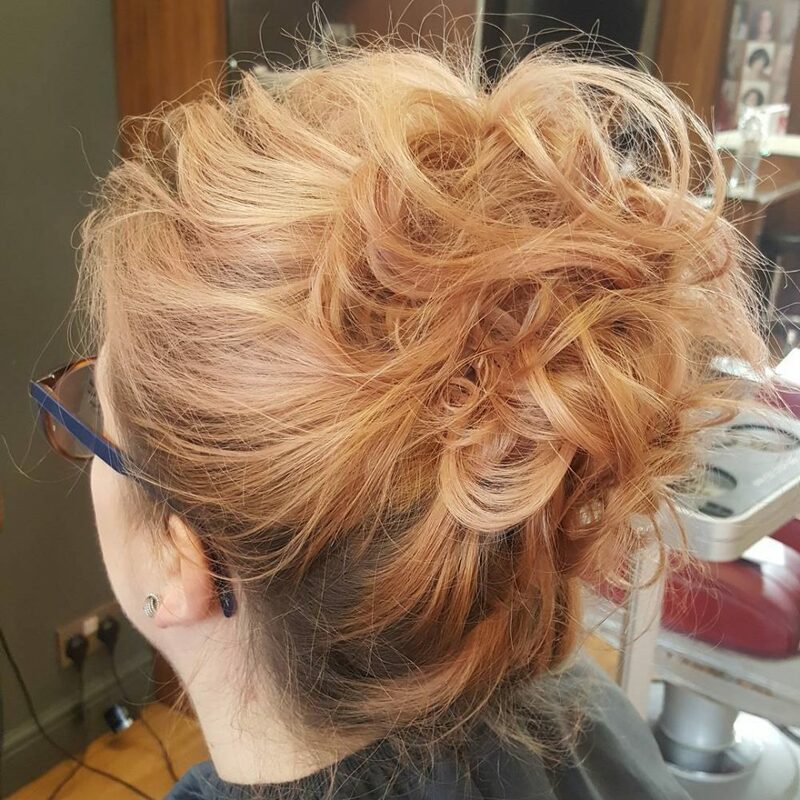 This loosely curled and pinned-into-a-bun look has a chic, rockabilly feel. 2 day hair will provide the best base for this upstyle! Create a round section between the front and back, placing the back section into a hair tie. Use bobby pins to pin some of the back curls around the bun. Use more pins to randomly pin the front sections out and away from the face. Dry shampoo will create the ideal hair texture for your dirty curls. Apply at roots where needed. Stronger face shapes such as square or oval will benefit from the softness of this style. Wavy and medium density hair textures will work best. 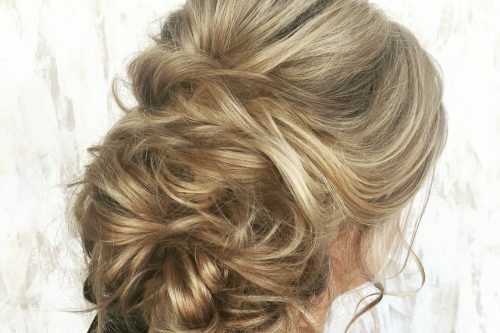 We love the awesome height created by softly curled pieces in messy hairstyle ideas like this one! 2 day hair is best here! Create a dramatic side section and curl your hair, remembering to roll the curls away from the face on each side. Start by taking large curled sections from the bottom and twisting and pinning them randomly as you work from the bottom to the top. At the very front, take an even larger section and create a giant curl, pulling out the ends of that curl towards the back for added texture. Your favorite dry shampoo will cause the ideal texture for your dirty curls. Apply it at roots where needed. A shine spray will also add the perfect sheen! Strong face shapes will benefit from the softness of this look. Thicker hair types also work well with the different ways to add curl and volume. This a great style to add an embellishment of your choice to either side of the look! Try your tresses loosely curled and pinned into a side-swept ponytail for an easy everyday look. Dirtier, curlier hair is the best base for this style! Break up curled hair with your fingers, creating a looser wave. Gently gather the hair into a ponytail, using subsections to twist pieces over the hair tie to “hide” it. 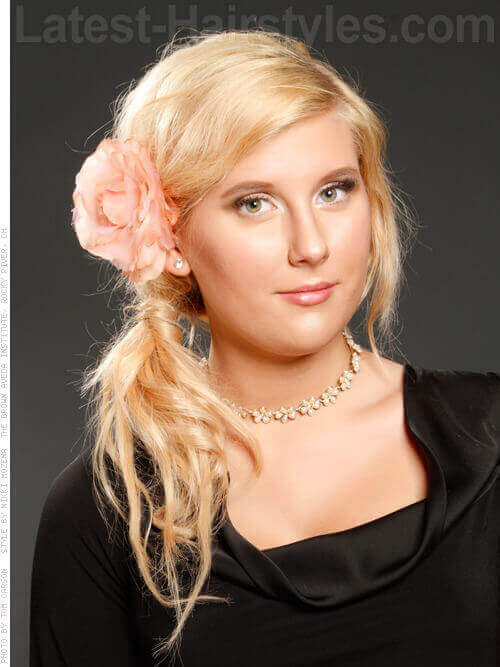 This is a great style to display any kind of hair accessory that you may have. Dry shampoo will cause the just-right texture for your dirty curls. Apply it at the roots where needed. A light hairspray to ease frizz may also be necessary. Square face shapes and naturally wavy hair will give you the best results for this look. 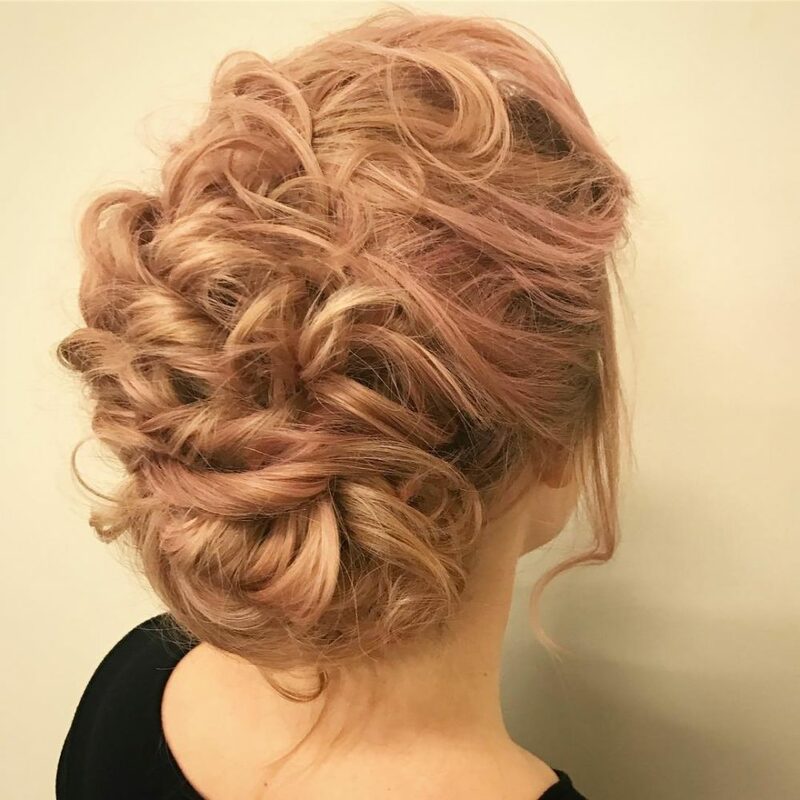 Naturally curly hair is half-hazardly twisted up to create great height in this beautiful mess of an updo. Dirty curlier hair is best for this! Take larger sections, one side first, and twist them around to the opposite side. Repeat with opposing side, making sure that the ends have been twisted towards the top of the head. Use hairpins to place curls where you want them, whether it be totally off the face, or leaving some out to frame the face. Dry shampoo will cause the ideal texture for your dirty curls. Apply at roots where needed. If you need to break up the wave, us a small amount of wax such like Bumble & Bumble’s Sumo Wax. Triangle face shapes matched with naturally curly or wavy hair work well for this updo. Don’t be afraid to really work your curls! The more shapely, the better.